Purchased on the Julia P. Wightman, Curt F. Bühler, and Lathrop C. Harper C-1 Funds, 2001. Title from caption (leaf aa3r). Imprint from colophon (leaf H7v): Caii Plinii Secundi Naturalis hystoriae Liber Trigesimus septimus & ultimus. FINIT. Venetiis impressu[m] per Magistrum Marinum Saracenum. Anno .M.CCCCLXXXVII. Die .xiiii. Mensis Maii. Regnante Illustrissimo Principe Augustino Barbarico. Some copies have a colophon dated 14 June; cf. Catalogue of books printed in the XVth century now in the British Museum. Printed in Saracenus's type 1:81R. Collation: aa⁸ bb⁶; a-z⁸ &⁸ A-G⁸ H¹⁰: 272 leaves, leaves aa1 and H10 blank. Paper format: Super chancery folio. PML copy leaf dimensions: 32 x 21.3 cm. Contemporary Italian blind-tooled brown morocco over wooden boards (33.5 x 22 cm. ), sewn on 3 supports by the Belluno Bindery A. Plain paper fly leaves; decorative endbands; painted fore-edge by Cesare Vecello (or an assistant) for Pillone. Initials BC stamped on front cover. Hand decoration: Rubricated, alternating red and blue lombards and paragraph marks, major lombards with red/blue penwork decoration. Annotations: No significant marginal notations in text. 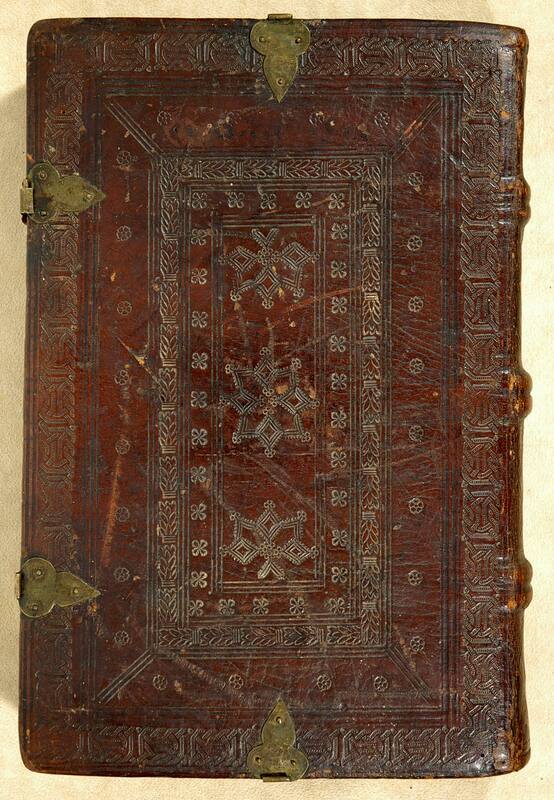 Contemporary manuscript foliation bottom right corner. Antonio Pillone (d. 1533), purchased ca. 1490-1510, by descent to Odorico Pillone (1503-1594) and Giorgio Pillone (1539-1611); Paolo Maresio Bazolle, purchased Pillone Library in 1874; Thomas Brooke (1830-1908) of Armitage Bridge, armorial bookplate (front pastedown), purchased before 1891, by descent to Humphrey Brooke; Pierre Berès, purchased in 1957, Bibliothèque Pillone label, no. 48; Dr. Crawford W. Adams (d. 2003), bookplate; his sale, part II, Sotheby's NY, 25 Nov. 1997, lot 148 (to Freilich? ); Joseph A. Freilich (b. 1952); his sale, Sotheby's NY, 10 Jan. 2001, lot 436; Pierpont Morgan Library, purchased via H.P. Kraus on the Julia P. Wightman, Curt F. Bühler, and Lathrop C. Harper C-1 Funds, Jan. 2001.